Before I was a brickfilmer, before I was a castler, I was a spacer. 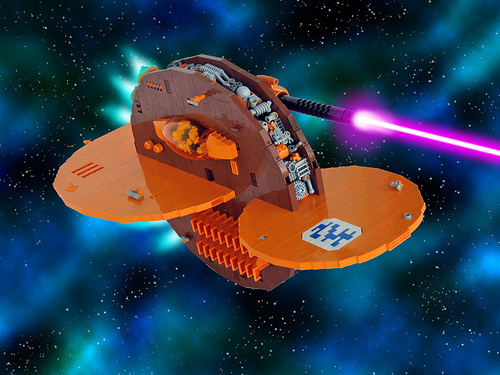 One of the reasons I eventually dropped out of building spaceships was it seemed all LEGO spaceships started to look the same, or all started to fit into fan-made subgenres. While this in itself is not a bad thing, it leaves many LEGO spaceships with a feeling of “sameness” to them. But every once in a while, someone comes along and builds a ship that is different from all other spaceships. Ogre by Nnenn is just awesome. Have you ever seen and brown and orange ship comprised of three intersecting disks? I thought not. Don’t forget to check out the complete Brickshelf Gallery! This is one of the more specal Nnenn spacecrafts that ought to be highlighted. I like the form but the color palette disturbs me to no end. I think we have never seen an orange and brown ship because it so disturbing. I love it! Its like, half spaceship, half breakfast. Yum! I especially love the greebling along the center disk. Are the orange disks airfoils for atmospheric flight? Or are they like the whale-tail on a hacked Honda Civic? That’s some craziness! Insane building skillz! Yet another Nnenn masterpiece! I actually love this color scheme. All it proves to me is that genius gets it wrong occasioanlly. whooda thunk it could be so good?